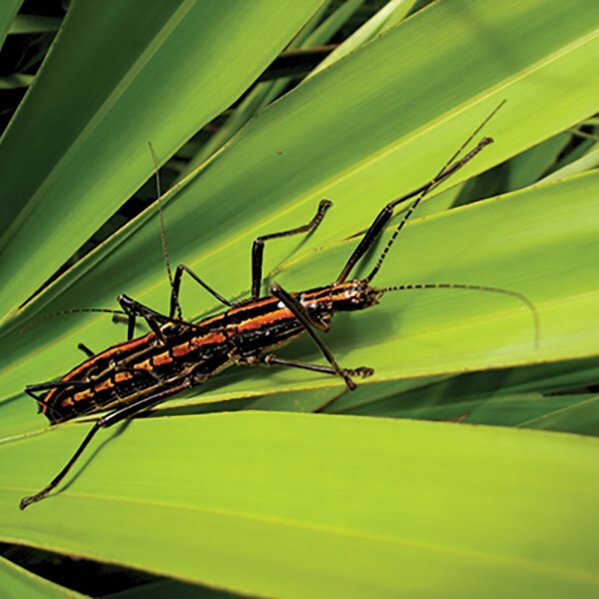 If you’ve ever encountered the Two-Striped Walking Stick, you’ll probably remember it. Anisomorpha buprestoides emits a strong milky substance when threatened that can cause painful irritation to the eyes and mucus membranes. Fortunately, copious amounts of cool water will ease the irritation, and symptoms should disappear within a few days. The Two-striped walking stick is a member of the stick insect family. It is also known by more exotic names including devil’s riding horse, prairie alligator, witch’s horse, musk mare and devil’s darning needle. It can be found throughout Florida and the Gulf Coast, as well as in Alabama, Georgia, South Carolina and in parts of Mississippi and Louisiana. Like all stick insects, it feeds on the leaves of shrubs and trees. It is particularly fond of azaleas, crape myrtles and roses. Wear gloves to pick them off and put them in a plastic newspaper bag to smother them. Make sure you wear protective eyewear to thwart the spray.